Msgr. Robert Sheeran is the Director of Mission & Ministry at Marin Catholic High School in Kentfield, CA. His pastoral and preaching ministry extends to Sunday Mass at Saint Vincent’s Orphanage for Boys, in San Rafael, also in Marin County. Bob Sheeran and I are classmates of the ordination class of 1971, for the Archdiocese of Newark, New Jersey. We began our studies at Seton Hall University in 1963 — so our friendship goes back many years. In this interview, Bob calls attention to the importance of the sacred texts and how these affect the preacher and the congregation. MR: I am Father Mike Russo, and welcome to Sunday to Sunday. This program is about the art, craft, and spirituality of preaching. 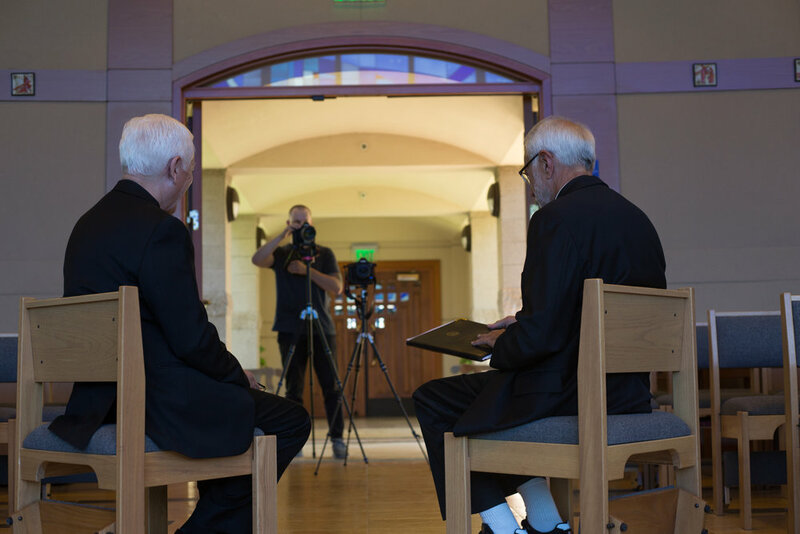 Today, I am speaking with Monsignor Robert Sheeran, who is the chaplain here at Marin Catholic in Kentfield, California. On Sunday, he ministers to a community at St. Vincent’s School for Boys, also here in Marin. Join me now, as we speak with Monsignor Robert Sheeran. MR: Monsignor Robert Sheeran, full disclosure, we are classmates and we go back to 1963. Where was that? RS: Seton Hall University together. MR: You remember those days? RS: I do, and fondly. Fondly. MR: And here we are in marvelous Marin. Behind us is Mt. Tamalpais. This chapel—explain a little bit about the chapel itself. RS: Well, the chapel is a high school chapel, with a magnificent window overlooking Mt. Tamalpais, designed by Brenda Belfield. It’s the Canticle of St. Francis in glass. MR: On Sunday’s, you minister to this St. Vincent community. Could you explain that? RS: Sure. St. Vincent’s was established in the 1850s. It was the first orphanage in the Archdioceses of San Francisco. Right now, there are a number of boys there, but in the 1920s someone gave a magnificent church for the boys. So, some of the boys come to mass now, but now the church is filled with folks from all over Marin, who come to share liturgy together in a beautiful environment. MR: I must say, having been at Mass with you and seeing how you have brought the community together, you have a certain style of celebration. One that is very kind of biblically based. Where did you develop that style? Where did you see it first, and how did you bring that about? RS: Well, I love the bible. I think the scriptures are my life. The Lord is a lamp for my feet. So, that has been central in my own life as a priest, and I feel that often Catholics are woefully lacking in knowledge of the Bible. So, not only is my preaching basically biblically based, but also as the Missal allows priests to introduce all the readings at the Mass, and I give sort of a little background. That’s something I get a lot of very positive feedback on. Often, when we sit down after the Gloria, people will drift right away, especially if it’s a reading with geographical terms, Acts of the Apostles. But, you explain the background, it gives people a clue about what to expect in the reading and they are following that. MR: Well, first when I saw that done was by Walter Burkhardt, a Jesuit, at Georgetown. To some extent, I have developed that style as well. But, it does kind of bring the liturgy together, because there is a whole and they are parts. One part, the part that we are looking at, is the preaching element. Obviously, there is some concern about preaching. Pope Francis’ Joy of the Gospel, is filled with his own comments about preaching. So, there is a concern there. What did you think was the greatest challenge today for preachers, for Catholic preachers in particular? RS: Well, it’s connecting. I mean for anybody that speaks, any communicator, you want to connect. To connect with a congregation that is often very diverse, is a real challenge, yes. Pope Francis—10% of his apostolic exhortation in The Joy of the Gospel, is given over to preaching. Make it meaningful in people’s lives. Don’t make it boring and connect with them. Know where your sheep are at. As he says, the priest should have the smell of the sheep and be able to—should be able to—try to connect with them in ways that are effective. MR: Of course, this goes back to rhetoric and good ways in which we write. St. Augustine has a lot to say about preaching, preaching effectiveness. RS: Yes, so he wrote a whole book on the De Doctrina Christiana—you know, about how one studies and understands scripture. Then, how one communicates that. He had three points that a preacher should strive for in their preaching and in our homilies. The first is to inform people. Give them some knowledge. Give them something to digest. The second thing is a word that translates probably best into English as “delight them”. I would say at the very least, don’t bore them. But, to be entertaining I think that’s a second thing. Otherwise, people will not learn very much unless you have got their attention. The third thing is to inspire people to action. MR: Yes, persuasion is difficult. I mean you can watch commercials many, many times and never go out and buy that car or buy that product. But, to persuade people to live a more moral, ethical life, you have to make that challenge and make it in a tender way. One where you are a witness to your own issues. RS: Right. The preacher—people read through people who speak very, I think very, very well. There was a line in one of Trollope’s novels. It was about a politician. Trollope says—he always came across as if he were dishonest, but he wasn’t. he would just say the same thing so often, it seemed that he was not authentic. So, I think the first thing the preacher needs to do is be ready to grapple with the meaning of, and the inspiration of this Sunday’s reading. What does it mean to me, and then what does it mean to the folks who are coming to St. Vincent’s to worship? MR: So, at what point during the week do you suddenly realize it’s time to get to the homily? RS: Well, I have a—since I have been here in California, of course when I was at Seton Hall for many years, I would go to different churches. I have the same congregation week after week. I come back on Sunday morning and as I unpack my Magnificat, the scripture readings, I look at the next week. Maybe with a pen I will circle a couple of ideas. So, I just want things to start folding around. I call them balloons. You know, the scripture readings will give me several balloons that are floating around. Some of those balloons will have to be popped, but yes, I will look at it on Sunday, just as almost a spiritual exercise that—in other words, it starts early. MR: Do you write your homily out? RS: You will get them in the first sentence and the last sentence, but often or not we will have three sheets of paper, and I know where I am going, but if you look at it, you would not be able to make any sense out of it. But, I know exactly where I am going, and I am able to flow, I would say, pretty seamlessly. MR: You file them away? RS: Yes, I do. I filed homilies away forever, but I don’t look at them. It’s very interesting. Rarely do I look at them. Sometimes now I looked a couple of weeks ago at a homily I gave a few years ago here, and I couldn’t read my notes. Sometimes they are really meant for almost for that week. I could not get the gist of where I was going. 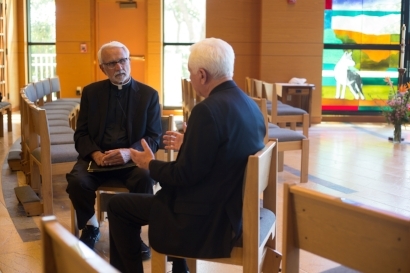 MR: You know, you are in a rare position where you are a priest, almost 50 years, as I have, but you also served as president of Seton Hall University, a major institution in New Jersey. You are, in fact, a public figure where you have to give a set speech. What’s the difference or I am assuming you have public relations people at a major university who would feed you with material. Did you ever accept that or did you write your own copy? RS: It would depend. You know? President for fifteen years, you know, if I were meeting a group of alums or other Regents, no. I would have two or three points I would want to make. Generally, vice presidents would say I would like you to include this in that particular talk. Some talks are very formal like a state of the university address. They would be written. MR: But, you also had some very difficult events at Seton Hall, one being that major fire where you had to minister to the loss of students. RS: Three students died, and a number of students—it was a tremendous tragedy. We had a memorial service for them and there were three or four thousand people in the gym and three to four thousand people outside in the field house as well. That would have been a homily though that would have been written out, and I would have brought a couple of people with me, trying to say exactly the right thing. That might have been the most important homily I have ever given. MR: When you are in a university or a high school setting, there are a variety of groups that draw on your spiritual strength. It could be the basketball team, or it could be a group of alumni. It could be a memorial service. There is a lot of peripheral thought that has to go into each of those. RS: Right. Here at the high school, for example, last week we had a Mass for 700 students. A third of our students are not Catholic, so that’s a particular segment. Some Catholic’s will be very practicing and others wouldn’t and then you have 70 or 80 faculty. The same thing on Sunday’s as well. You know? I know sometimes people come to the Mass that haven’t been to church in ten or twenty years. Other people have never missed Mass. So, saints and sinners and you try to give a word that speaks to all of them. I think part of that is trying to keep it simple. Give them something to digest. You know, at BBC they direct their news broadcast to 12-year-old’s, so I don’t know if you have ever heard that, but they don’t get too far beyond that. But, there is something to that, I believe. Keep it straightforward, keep it direct, and you know, I might give a different homily here in the morning than I would on a Sunday. MR: The lectionary is divided in such a way that we have a three-year cycle. It provides us with a way in which we use scripture. I am always wondering whether there are parts or nuggets of scripture that are less represented over the course of a year? RS: I don’t think so. You know, I think one of the great achievements of the post-conciliar reform in the liturgy was the lectionary. It’s amazing when you realize the Roman-Catholic lectionary has been adopted by Episcopalians, Presbyterians, Methodists as a lectionary that they would use. There is something about a paradox in that. No, I think the selection of readings by and large over the course of three years—I know the weekday cycle as well—really gives us everything that we need to be fed on with scripture. MR: In reading the Vatican II documents on Scripture and preaching, I am always touched by the fact that the preached word can change people’s lives. Preached word can change people’s lives. In what way have you seen people be touched by your preaching and the preaching of others, actually? RS: Well, my life has been changed by a couple of extraordinary preachers. They touch the heart. They touch the heart, and that’s what I try to do. I think that I have touched people’s hearts and different times. You know, I will give you a couple of examples more recently here in Marin of people that have been away from church for a very, very long period of time and have come to church and have received a word that gives them the encouragement they need to come back and begin to change their life. You know, the Eastern Christianity has at times seen preaching as the eighth sacrament. But you know, when Jesus preached, he changed people’s lives. The acts of the apostles, they apostles—preaching changes lives. I think it changes also the life of the preacher himself if he is serious about–. RS: As a witness, and also yes in preaching the word. Do I believe this word? Do I live this word? So, often I am preaching to myself. MR: So, who were those people that were models for you? RS: One was—it was actually a priest who is still alive and is close to 90 here in San Francisco Archdiocese. Monsignor Warren Halloran. He was a spiritual director in Rome at the time. There was another priest when I was growing up, you may know him, Father Harvey Balance. As a high school student, he was just—I loved listening to him. He was a creative guy, very interesting speaker. He caught my attention. MR: So, that creativity and the ability to engage with people. You mentioned also that it has to have some level of satisfaction. People need to follow you. Humor is a way of doing it? RS: Humor is absolutely, and I bring humor into it. Yesterday, for example, I was talking about last supper discourse of Jesus. It is his will and testament. I said; centuries back your will was what you did with your property, and the testament was what you did with personal items, but sometimes some of the rabbi’s quote testaments what they write out what they want to share with people after they are gone. I said; one of the finest eulogies I have ever heard was a eulogy a man wrote himself a testament to his family. I said I have written one too, and I said my friends basically say it’s another ploy on my part to have the last word. They laughed, so they got that, but I really encouraged people to write a testament for their family. MR: But, writing for humor is extraordinarily difficult. Many years ago, Conan O’Brien won the Emmy for best late night talk show host and he is holding up this statuette and he invited his writers to come with him to accept this award. Approximately 25 men in tuxedos and maybe two women came up. If I had that many writers, I would be that funny as well. It’s not easy to write for humor. MR: So, memorable homilies that you have witnessed or you have actually had to bring to people? Memorable homilies that you–. RS: That I have given, or that I have heard? RS: Well, I think homilies sometimes—today actually, is the 20th anniversary of my mother’s death, and I think for many priests the most difficult homily they will ever give is for their mother or their father. So, that was one that was written out. I think often funerals or tragedies are times to say something very—what does God’s word have to say to them in that particular situation? Also, weddings too. Pivotal moments, transition moments in people’s lives. We have a baccalaureate Mass coming up. I always enjoy preaching that. Able to define the moment. Something is happening here that’s very important. MR: You know, the preacher is called a witness. Could potentially be called a herald, an interpreter. But, occasionally a prophet. Sometimes people who have the privileged position that we have, may move more into the prophet side of that ledger, and disturb people in a way that can be difficult. RS: Yes, it is. I think we have all witnessed prophet priests, and sometimes I feel they don’t get it right. Sometimes they have their own personal issues. I think that has to be discerned very carefully, depending on what the issue is. You know, prophets—some preachers see themselves as prophets. Anti-abortion prophets. How many anti-abortion homilies can a congregation sustain in a year, and so forth? Social justice should certainly play a role. You know, for example, yesterday I was speaking about experiencing the love of Jesus, then doing something with that. Then as I ended I said, “We each need to do something with that.” I said, “What does that mean for you? I don’t have the faintest idea, but the Lord does. You keep your ears open. He will show you individually.” I think that’s often part of my preaching is give them the experience of the Lord and what that means, but then they have to take it a step further in their own lives, whether they are retired or high school students, a born-again Catholic, or a dyed in the wool Catholic. That’s very difficult and you don’t—I don’t like to go through a list of possible things they may do. That can become a little annoying. MR: And while we witness the word, telling people what to do is probably not the best solution? RS: No, it’s what we need to do—it’s all—we. I try never to use “you”. You know, we Catholic’s often make the mistake—and sometimes I will underline it by saying this particularly happens in my own life too. I think we are there. You know? Paraphrasing St. Augustine, you know, for the congregation I am a preacher, but with them, I am a listener of the word too. I think that somehow that has to come that I am a listener as well. You know, there are many different models. John Wesley, one of the great preachers of his era, the great awakening, said my view of preaching is that I set myself on fire and let people watch me. So, it’s a beautiful image. Your own faith and sharing that faith and you know, allowing people to watch and experience that. MR: Your own education was in Rome and finished your PhD or S.T.D. and Gregorian—at Angelicum. Yes. You actually did your PhD, your doctoral degree on [Wilberforce], which was again one of the great heralds of preaching. RS: Well, it was the great liberator. William Wilberforce’s son Robert, who was an Anglican priest, and then converted to Catholicism, but died before he became a catholic priest. But, he wrote very, very serious theology, but then he also very interestingly, he also wrote charges to his clergy. He was in charge of the clergy up in Yorkshire. Part of my dissertation is taking his—he was one of the few Englishmen who read German, so he knew serious German theology, but he could take it and share it with the clergy. That always struck me as something priests need to do. I mean we need to understand theology, understand the big issues, know what is in scripture, but yet be able to serve it up to people in ways that are digestible to them. MR: One of my concerns is that priests do not often hear other priests preaching and don’t have enough experience with seeing other ways of doing that same work. RS: Right, right. Now for some of us, you know, when we are on vacation—I like to attend mass in the last pew. Sometimes, it’s enlightening, and sometimes its not. MR: Yes. Because we also have to remind ourselves that we are often fragile vessels and have to keep working at it. RS: Absolutely, absolutely. I mean one of the joys for me, as I have gotten older, has been preaching. I mean I am no longer a president of a university. I am in a magnificent pastoral situation with the students here, with daily mass, and also St. Vincent’s. You know, it was a church that was half full, and now it’s standing room only now. We also do something at the end. We have an agreement, a covenant, that if they are late, I never try to get kids to mass on time. I often say the Gloria is the entrance hymn, but that doesn’t bother me. But, I don’t like people leaving early. We serve coffee and donuts afterward, but not until I exit the church. But after communion as, you may remember, we sit in silence for a few moments. Sometimes I will say; what is the word that has spoken to you? People will mention that as one of the most important parts of the Mass. We think they are anxious to get out, but they love sitting there. I mean we have 300 or 400 people sitting in silence, and it’s really silent. It’s a very, very powerful moment. MR: Oh, it’s an extraordinarily powerful moment. I witnessed that and found it to be a very good remedy for many thousands of excuses for people to jump in their car and get out. RS: Well, yes and also not serving the donuts until I leave is a good remedy as well. But, yes people will stand in the back and they won’t leave. They appreciate the silence. Kids appreciate that too. So, almost every mass I have some silence. Even the brief weekday masses here. MR: And, it brings people to a stronger meditative sense. RS: Yes, because the word needs to be digested. You know, the beautiful thing about scripture, I think it was Gregory the Great that said scripture is like a stream in which elephants can jump in and they are safe and little sheep can walk in and they won’t drown. In other words, it’s always—there is something there for everyone. That’s part of the preacher’s role, I think, to make sure that the elephant swims and that the little lambs get across the stream safely. That is with me often when I am preparing a homily. MR: Well, thank you so much for this time and that’s a very powerful image, indeed. RS: I mean as we both know, Michael, just to be able to preach to people, to their deepest longings and needs and dreams, I mean it’s a privilege. It’s an absolute privilege and an honor. It holds us very accountable to a much higher authority than politicians. MR: Thankfully. Bob Sheeran, thank you for being with us, and I want to thank you for being with us as well. This is Father Mike Russo for Sunday to Sunday and the Francis Factor. MR: He who exalts himself will be humbled. He who humbles himself, will be exalted. This is the theme of the 31st Sunday of the church year. We have traveled some ten miles from Marin Catholic, here to St. Vincent’s Home for Boys in San Rafael. We are here to listen to Monsignor Robert Sheeran as he speaks to this congregation this morning. RS: Lord, be with you. A reading from the Holy Gospel According to Matthew. Remember the perspective of this passage is it is delivered during the beginning, the first days of holy week, just days before Jesus’ death. Jesus spoke to the crowds and to his disciples saying; the Scribes and Pharisees have taken their seat on the chair of Moses. Therefore, do and observe all things whatsoever they tell you, but do not follow their example, for they preach, but they do not practice. They tie up heavy burdens, hard to carry, and lay them on people’s shoulders, but they will not lift a finger to move them. All their works are performed to be seen. They abide in their phylacteries and lengthen their tassels. They have places of honor at banquets, seats of honor in the synagogues, greetings in the marketplaces, in the salutation “Rabbi” But, as for you, do not be called Rabbi. You have but one teacher and you are all brothers. Call no one on earth your father. You have but one Father in Heaven. Do not be called master. You have but one master, the Christ. The greatest among you must be your servant. Whoever humbles himself, will be exalted. But, whoever humbles himself will be—excuse me—whoever exalts himself, will be humbled, but whoever humbles himself will be exalted. The Gospel of the Lord. I only trip over the gospel when I am being filmed right in front of me. We will cut that, I am sure. Perspective. I think we all know that how we see something often affects what we see. Take St. Vincent’s for example. Some of you might be here for the first time. So, you see the congregation and the facility that is a beautiful church in one way. Some of you have been coming here to mass for decades and you see it another way. Same St. Vincent’s. Last spring, I met a man who was one of the buys here in the ‘60s and had not been back since. He was delighted to walk around. He saw it one way. Derek [inaudible] one of boys, today, who is a server at the mass each week and a new convert to Catholicism, I am sure Derek sees it in yet another way. A priest here at St. Vincent’s standing in front of the congregation week after week, sees it one way. Carlos, who is filming me in the first pew sees it yet in another way. Same reality, but different perspectives. There are movies and novels out there which tell the same story. The folks see people and see events differently depending upon their perspective. There was a novel many years ago, the Rector of Justin, about a school headmaster, but many people that worked or lived with him saw him in very different ways. In sociology there is a principle called the “Rashomon Principle.” It takes its name from a cult Japanese film half a century ago about a crime that’s committed and different witnesses see the crime and what happened yet in different ways. Perspective changes often what we see. Friends, Jesus heals more people with blindness, inability to see, than any other disease or ailment. Often when the people are healed like Bartimaeus in the Gospel, the only person Jesus ever healed of a disease whose name we know. Bartimaeus gets his sight back, but then it says immediately he follows Jesus on the way. You see, Bartimaeus not only was able to see physically, but that miracle was a gift of faith, he could see really what was the case, and therefore followed Jesus on the road. That’s probably why we know his name because he became one of the early disciples of the church. Faith, we might say, is a way of seeing. It’s a way of perceiving. Perceiving God. One who believes, one who doesn’t, see God quite differently. The reality of God. We see ourselves different. Who we are. How we fit in. What our destiny is. We see the world around us and people differently through faith. It’s a way of seeing. St. Paul said to the Ephesians: my friends may God open the eyes of your hearts. The eyes of your—the inner reality, which allows us to see what really, really is. There is an old piece of wisdom; human piece of wisdom, and I am sure you have all heard it. If you change the way you look at things, the things you look at will change. Maybe that is an irritable person at work. Change the way you look at him or her and it will change. Maybe its an illness or an affliction. Change the way you look at things and the things that you look at will change. This is the key, in my view, of Jesus’ view of the Pharisees, for they had a twisted perspective on faith and on religion. Instead of the responsibility for care of souls, they were interested in control of people. Instead of bringing comfort and joy to people heavy burdened in life, as we all are, instead of bring the comfort and joy, the community of faith, they were interested in exacting burden upon burden. Making clear delineation between those who were in, and those who were out in the name of God. Their positions and their power were all important. What about us? What about our perspectives? Our faith-wise perspectives? Our human perspectives? It has always seemed to me this image gets it, that in our own lives, we need to replace the mirrors with windows. We often live in rooms with lots of mirrors. Me. Mine. Very focused on ourselves instead of taking those mirrors, always keeping one or two so that we can look carefully at ourselves, but destroying some of the others and replacing them with windows so that we can look out on the horizon and see what really is. We are not the center of the universe. None of us is. Jesus gives us the key to understanding how we do this today, I think, right in the Gospel here. The greatest among you, will be your servant. To be a servant means to be focused on what the Master wants, not what I need or want or desire. To be focused on others. This is the key to salvation in the Gospels. But, also there is a lot of research out there today. The happiest people are the people who are focused on other people, not on themselves. St. Paul puts it beautifully today when he talks about his own shepherding of his flock, unlike the Pharisees, he said I worked for a living when I was with you. I treated you as a nursing mother treats her child. There is nothing more generous or giving than a woman who is nursing an infant totally dependent upon her. Maybe this is Jesus’ point today. If we start acting more like servants of the Lord, and of one another, we will begin to see things in a new perspective. Remember Jesus said of himself, the Son of Man is not come to be served, but to serve and to give His life as a ransom. That’s exactly what this altar is this morning. It is the place in which we draw the grace and the strength of this ransoming to go out the front doors and live a free week ahead. If we begin to see with a new perspective, it will be the perspective of Jesus. He calls his disciples. He calls us. Then and now, to be servant-leaders. Taking whatever time we have, whatever talent, whatever treasure we have, and to put it at service more generously of one another. Then, we will begin to see things. If we act in certain ways, we will begin to see things in new ways. Maybe St. Francis said it most succinctly; it is in giving that we receive. It is in dying—dying to ourselves—it is in dying that we are born to eternal life. So, my friends, lets open our eyes at this Eucharist and see with the perspective of the Lord who redeemed us with the gift of himself. That perspective will carry us through this week, our lives, and into eternity. In the name of the Father, and of the Son, and of the Holy Spirit. Amen. MR: In my conversation with Monsignor Sheeran, he mentioned that preaching is the eighth sacrament. The sacrament of witness. I want to thank those who helped us here at St. Vincent’s School for Boys, as well as those at Marin Catholic. For Sunday to Sunday, I am Father Mike Russo. Sunday to Sunday Productions, Inc.